A Gardener’s Eden in a Busy City. A photographer’s holy grail. A retreat from armageddon. Am I little over the top? Probably, but the Conservatory Garden is one of our favorite green places, and quite possibly one of the quietest in New York City. Officially. The sign at the entrance says Official Quiet Zone. Dogs okay on leash, bikes okay in tow. And please don’t pick the flowers. We’ve visited twice in summer, once at high noon, and again, because we loved it so much, at that hour before dusk when shafts of gold highlight a garden. 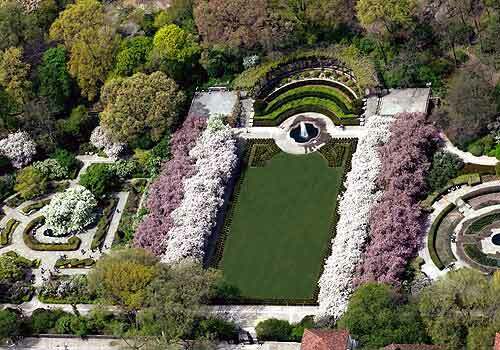 We’d like to visit again, in springtime, when allees of crabapples and tulips, 12,000 of them, are in bloom. 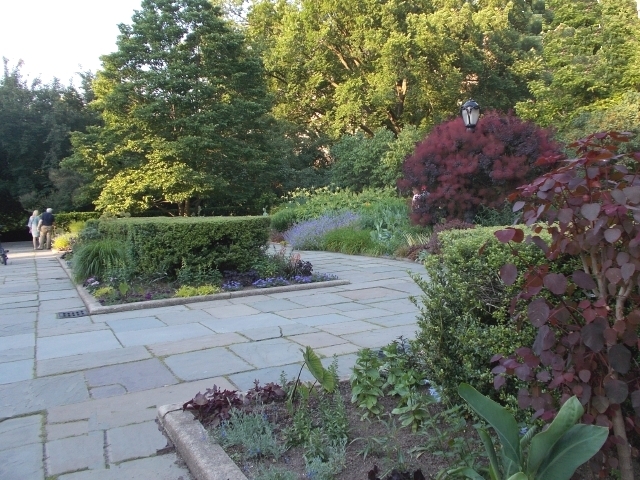 Elegance is the byword for this six-acre garden. 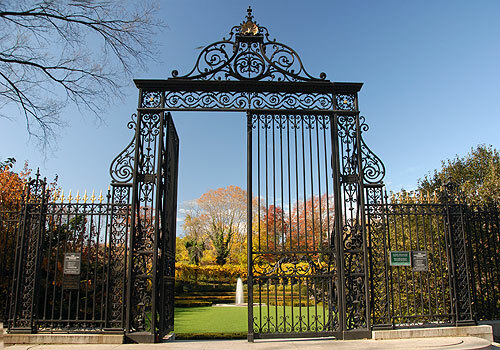 It begins with the entrance, the monumental wrought iron Vanderbilt Gate on 105th Street and Fifth Avenue, across from the Museum of the City of New York. The gate has its own history quite apart from the garden. It was forged in Paris in 1894 for the pretentious Fifth Avenue estate of Cornelius Vanderbilt II, a classy entry to the largest Gilded-Age mansion in the city — except in old photos it comes off as a superfluous add-on to the building’s cluttered façade. Today the gate opens onto a staircase leading down to a lawn that seems to stretch to forever, until you spy a fountain playing in the distance. 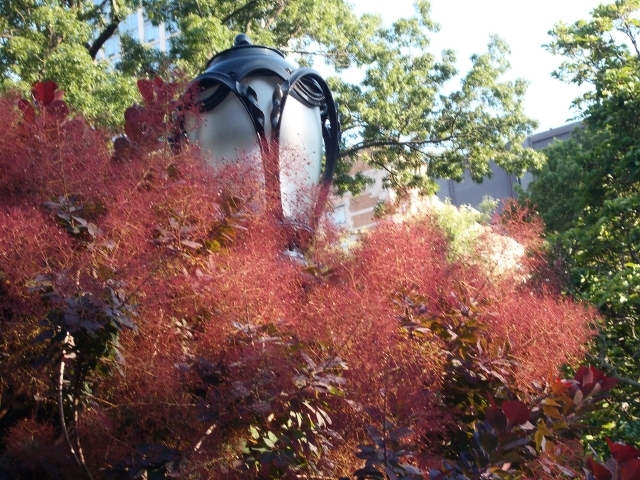 Crabapples embroider its edges, and tiered hedges rise behind the fountain. Beyond, and barely visible in summer but dripping with wisteria blooms in spring, is a curved pergola, photogenic and perfect for spring weddings. Turn to your right (north) and you find yourself stepping into a patch of garden from Versailles. Concentric circles of parterres planted with knot gardens of glossy germander and bronze begonias surround a fountain with Three Dancing Maidens. Formal and muted on a summer evening, the periphery garden has already exploded with tulips in spring and will again capture the limelight with chrysanthemums in fall. On this summer evening, hot pink Betty Prior roses snag our attention, and arches vining with white roses evoke an air of romance. 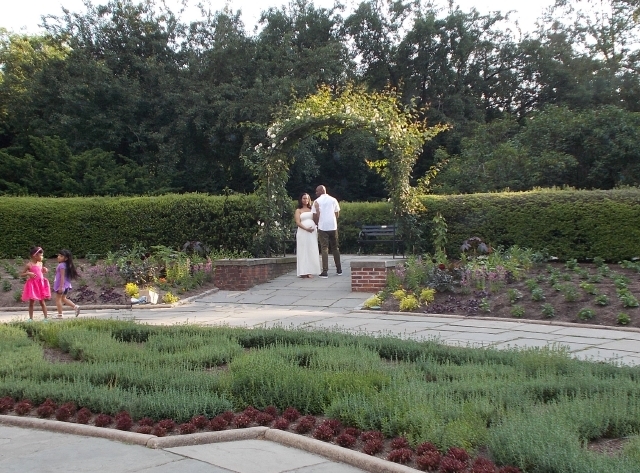 Ah, but then, there is the truly romantic Secret Garden south of the Great Lawn (left of the gate) reminiscent of gardens we loved in England. Bully hedges create a maze for a directionally challenged wanderer who soaks up solitude and serenity and gets lost in patterns and colors and feels compelled to see what’s just around the bend. What a backdrop these hedges form for glorious beds of shrubs and perennials, closely planted, nudging one another into a tapestry of color and texture that plays under saucer magnolia trees so twisted and tumbled they must be centuries old, but of course they are not. Young and vibrant smoke trees are bold grace notes tucked into the landscape. Inevitably the paths lead you to a little pond bowered by a magnolia and strewn with water lilies. It’s a tranquil place and benches invite you to set a spell and gaze at the enchanting statue of a young boy and girl modeled after the children in Frances Hodgson Burnett’s Secret Garden. Behind the magnolia a bosk ascends a rise. 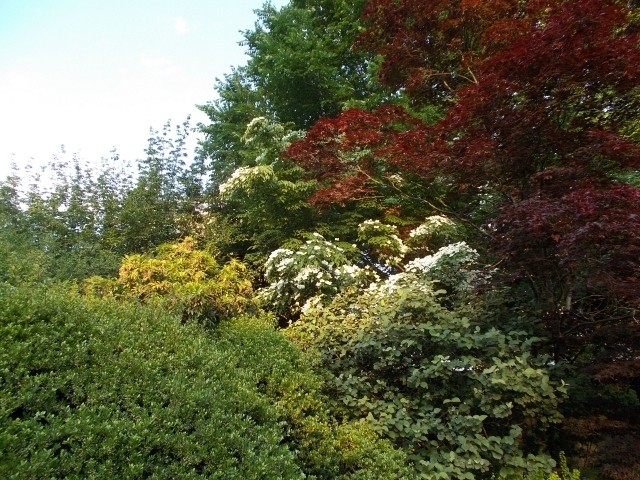 Its woodland foliage glistens in shifting sunbeams and ligustrum blooms sparkle. In the dusky silence, the garden seems to fully enclose us. Visitors speak in murmurs, or not at all, in this sanctuary from the avenues beyond. Why hadn’t we heard about this oasis sooner? It’s been around since 1937, designed under the auspices of Robert Moses and planted by WPA workers during the depression. The garden replaced the glass houses that had supplied cuttings for park plantings for 35 years, hence the name Conservatory Garden. By the sixties and seventies, though, with city credit tight and crime rates high, maintenance of Central Park was more headache than reward. Fortunes changed when private citizens began working with the city to create a dynamic public-private partnership that would become the gold standard worldwide for park conservation. 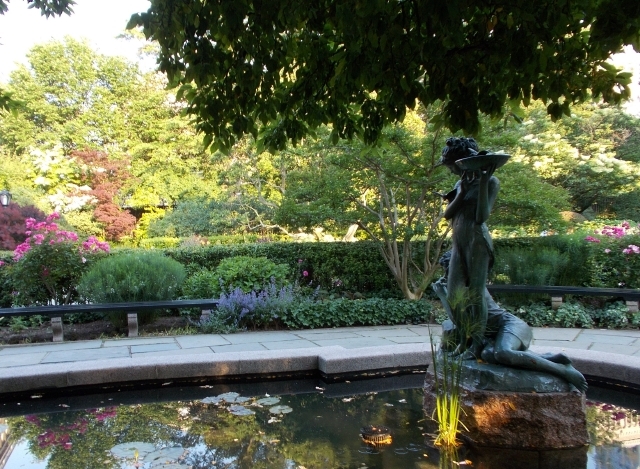 A restored Conservatory Garden opened in the 1980s. 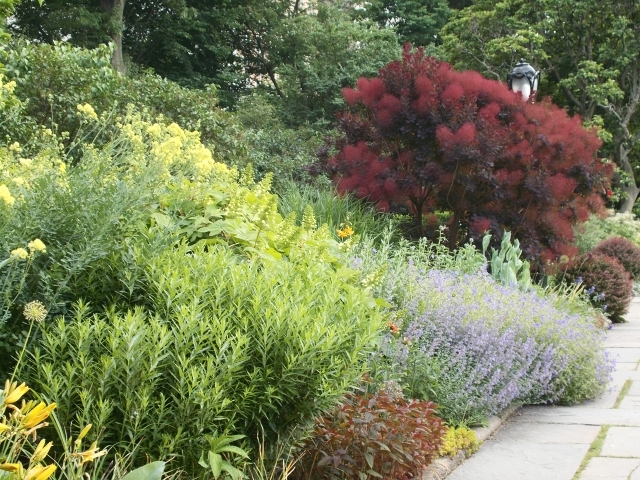 And the Conservatory Garden is one of its brightest stars.